This authentic recipe for Drago's charbroiled oysters is from the horse's mouth—Tommy Cvitanovich, who owns Drago's Seafood Restaurant with his mother, Klara Cvitanovich, in New Orleans and Metairie, La., and now in Jackson, Miss. Cvitanovich says, "This is the perfect dish for those who want to enjoy oysters in their unadorned form, but can't or won't eat them raw. Once you start eating these charbroiled ones, you won't be able to stop. Don't attempt this without freshly shucked oysters and an outdoor grill." The restaurateur developed the recipe more than 20 years ago in response to the raw oyster scare circulating at the time. 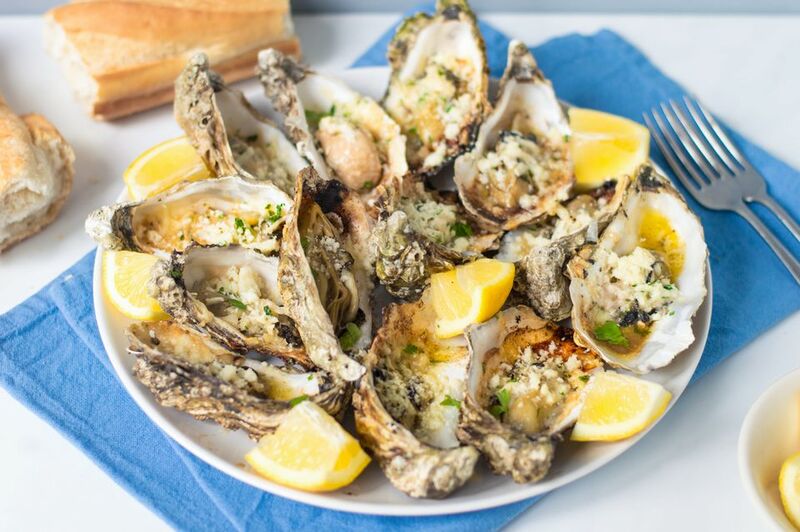 Since oyster stock is the best liquid to cook seafood in, he says, he knew charbroiling oysters would produce a good result, especially since it was a take-off on his already popular grilled redfish. His new menu item took off like a shot. The Cvitanovich family is of Croatian descent and it was Croatian sailors who brought their fishing skills and hard-work ethic to Louisiana in the 1800s to soon dominate the oyster farming trade, which has become one of Louisiana's largest industries. It's not surprising that Croatians would be such great fishermen. Their huge coastline along the Adriatic Sea is the source of income for the majority of the inhabitants living there, in cities like Dubrovnik, where Klara and her now-deceased husband, Drago, emigrated from. Klara Cvitanovich has shared her stuffed cabbage recipe, fritters recipe, and apple strudel recipe with readers. Heat a gas or charcoal grill to high heat. In a medium bowl, mix butter with garlic, pepper, and oregano. Place oysters on the half shell right over the hottest part. Spoon enough of the seasoned butter over the oysters so that some of it will overflow into the fire and flame up a bit. The oysters are ready when they puff up and get curly on the sides - about 5 minutes. In a small bowl, mix together the grated Parmesan and Romano cheeses and sprinkle on top of the oysters followed by the parsley. Serve on the shells immediately with hot French bread. Along with the oysters, you will also need a short knife or another thin-edged instrument for shucking. An actual oyster knife is great, which is nice because it has a guard around the blade to keep your hand from slipping, but a screwdriver (flat head, not Philips!) and even a table knife work as well. You want something with a thin edge that you can work between the shells, but that is also strong enough to use to pry open the shells. Make sure to have a rag, kitchen towel, or oven mitt to be able to hold the oyster. Just know that whatever you use will get pretty darn acquainted with oyster shell and oyster juices and may never truly be the same again. When you shuck the oyster, you can either hold it or lay it down on a flat working surface to hold it steady. Try both ways and see which way feels easier, safer, or more natural to you.